Staying on top of the laundry is a constant battle for me, even after over 17 years of running a household. I’ve tried different methods and schedules over the years, and of course, the amount of laundry in the house has grown as our family has grown, but I’ve never reached the point where I really felt that I was completely on top of it. In the last couple of years, we’ve had a system that works quite well for us – when we actually do it like we’re supposed to! Let’s face it, the best system in the world is useless if it’s not being followed. When we remember to do it as planned, it works well, when not, well, let’s just say we have baskets and piles of laundry around the house more often than we should 😉 . When one person doesn’t do their part, the whole system breaks down. An all too common sight in our house. 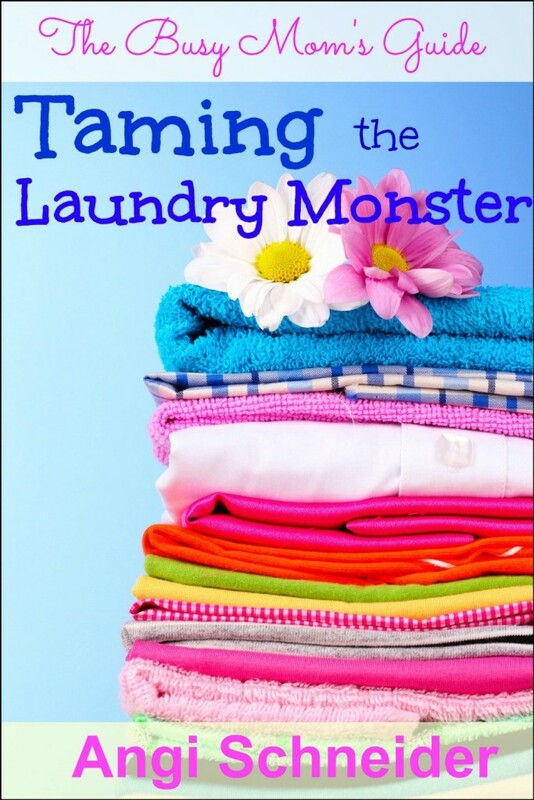 Enter Taming the Laundry Monster by my good friend Angi at SchneiderPeeps! I’ve known Angi and her family for many years and she’s the real deal! She’s a wealth of information on gardening, frugal living, sewing, preserving, homeschooling, running a household, and yes – even laundry! 🙂 She saw that, as ridiculous as it sounds, laundry is something that many struggle with, and set out to fill the need for a simple, encouraging resource for all things laundry-related. The result, Taming the Laundry Monster, is a quick, encouraging read, full of practical ideas. It’s short and to the point, but definitely not lacking in substance! I’m not sure why laundry seems to be a monster. Maybe because we live in a time where everything is fast and no matter how hard we try it still takes at least an hour to wash and dry clothes in a washer and dryer. Maybe because we live in a time of such abundance that we feel it’s somehow yucky or unsanitary to not wash clothes after each wear. Maybe it’s because it’s a job that truly is never ending. Whatever the reason, laundry has become a four letter word in many homes. My hope for this book is that you will begin to tame this monster called laundry, feel a peace in your home and let go of crazy ideals that are holding you back. She gives the positives and negatives of each, and then shares her own story and system (which is actually a combination of the first two methods). I was surprised to see that her laundry system is almost the same as mine, and implementing some of her tips has helped me make sure we work our plan and stay on top of the “monster”! Next, she walks you through coming up with a system that will work best for you and your family, and offers practical tips and hints for getting the laundry done efficiently and frugally, including tips for removing stains, mending, and ironing, and recipes and instructions to make your own liquid laundry soap, softener, dryer sheets, and odor remover. One thing that having a larger than “normal” family has taught (and is still teaching!) me is that I can’t micromanage everyone! So I especially loved her reminder that sometimes “done” is better than “perfect”, and I need to just get over things like the kids not folding or organizing their laundry exactly the way I would do it. It’s more important that the job gets done, we have clean clothes to wear that are reasonably organized, and my kids are learning an important life skill that will serve them well as adults, than that things get done exactly the way my ideal says they should. The book is short, easily read in one sitting. Angi’s sense of humor and heart to encourage others shine through the pages, and she makes an organized, efficient laundry system seem attainable! Taming the Laundry Monster is the first in what will be a whole series of short, simple, to the point guides for busy moms on various topics. Check out the website for more information. The book is available in both PDF and Kindle format for $3.99. Angi has very generously offered a coupon code for my readers to purchase the book for ONLY 99¢ from now through Wednesday, 10/16! Just enter coupon code PURPOSE at checkout. Linked with Thank Goodness It’s Monday, Mostly Homemade Mondays, Natural LIving Monday, Better Mom Mondays, Hip Homeschool Hop, Titus 2 Tuesday, Teach Me Tuesdays, Works for Me Wednesday, Wellness Wednesday, Authentic Simplicity, Welcome Home Wednesday, Hearts for Home, Thrive at Home, Fellowship Fridays. 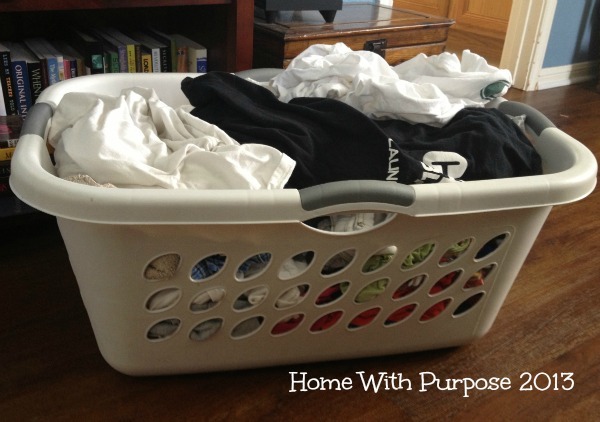 A timely post as I ignore the growing piles of laundry in my mine and the kids’ room ;)! We’ll be in emergency mode in about 24 hours if I don’t tackle this soon!! Laundry laundry laundry LOL It never ends. speaking of which I really should go do some!